vMOX leaves no stone unturned in ensuring that our clients’ mobility spend is the lowest possible. Every single month. Following our comprehensive methodology, our team scrutinizes every aspect of the mobile environment to identify cost reduction opportunities. 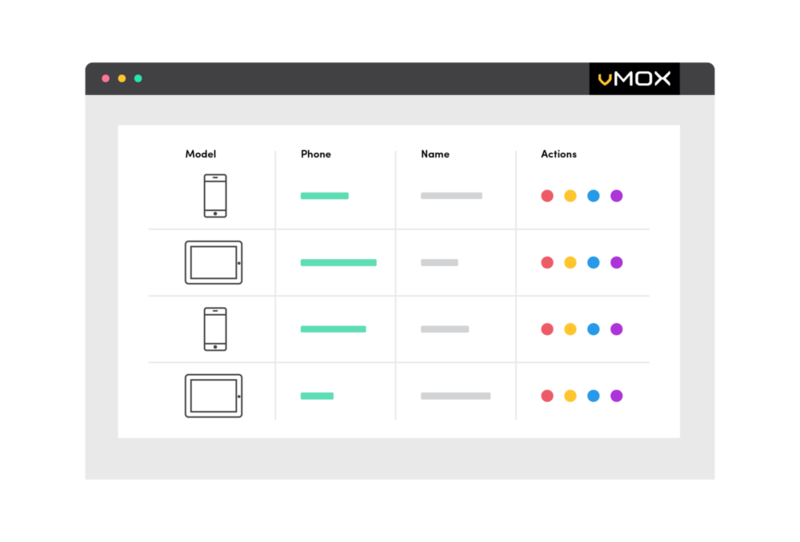 Leveraging our patented algorithm-driven software, detailed processes and experienced team, vMOX analyzes all users, devices, features, usage and corporate policies to maximize savings. On average we reduce monthly bills by 20% to 40% through a variety of proactive initiatives, and work hand-in hand with clients' internal teams and/or telecom and wireless expense management platforms (TEMs, WEMs) to deliver maximum savings. And since all of our work is done behind the scenes, changes are transparent to users with no interruptions or downtime. "vMOX is saving us around $25K per year, which is significant dollars for any midmarket company. That savings can fund a new security initiative, upgrade of phones, new servers, etc. All of those items make a company more successful, which benefits all of us." Mobile usage is dynamic, but most corporate mobile rate plans are static. Variables like employee turnover, international travel, vacations and industry ‘busy seasons’ impact your company’s mobile usage every month. But how does that match up with what you are actually paying for? Regardless of whether you utilize shared, pooled or unlimited usage plans, constant rate plan optimization is absolutely necessary to keep mobile costs low. vMOX’s patented algorithm-driven software continually analyzes usage patterns and determines the most cost-efficient mix of plans and features for each line on your account, at every given moment. We maintain a database of thousands of rate plans across all providers, allowing us to select the plans that best fit your environment. When changes are needed, orders are electronically submitted to the service provider, ensuring the fastest implementation time possible. International Management - Integration with corporate travel systems allow us to proactively activate/deactivate appropriate plans and features based on need, eliminating unnecessary roaming charges or costly overages. Pool Balancing – If our algorithms determine that pooling usage is the most effective strategy for your environment, we proactively track usage and thresholds and adjust lines as needed to right-size your pooled usage plans to avoid overage charges. Provider Negotiation - We deal with providers every day, giving us unique insight into negotiable terms and conditions, promotions and discounts. Our clients can leverage that knowledge to secure more favorable contract terms. Other savings-driving techniques we utilize include Zero Usage Containment, Device Tracking and Cold Storage, Late Charge Avoidance, Mid-Cycle Rerating, and Equipment Cost of Ownership Analysis. Continual invoice and environment audits are an integral part of our cost reduction and control service. We regularly analyze our clients’ entire mobility environments to ensure the execution and accuracy of all savings initiatives identified by our optimization efforts, and to isolate any perceived billing abnormalities. Our comprehensive methodology includes checks and balances to maximize our optimization efforts. All service orders are tracked to verify completion by providers, and we submit dispute tickets and adjustment requests when justified. We also regularly audit invoices to reconcile line, user and device info, and compare contracted rates with actual provider billing to ensure complete accuracy. Erroneous charges are automatically disputed with provider and credit requests are submitted, tracked and verified. We also monitor your environment looking for anything out of the ordinary, such as unusually high or low usage by users, zero usage devices, and overlapping services. When an anomaly is detected, our team proactively investigates to determine if it’s legitimate, if it’s the result of an honest mistake, or an intentional fraudulent event. Most employees in corporate-liable mobility environments have no insight into their usage, or the corporate guidelines governing it. Sharing information with employees and supervisors about their specific mobility costs creates accountability and encourages a shared responsibility for the expense. This helps correct excessive and/or abusive behavior, which in turn leads to additional reduced costs. The Employee Snapshot e-mail is an easy-to-read detailed analysis sent to each employee monthly. It provides a full cost and usage breakdown, complete with graphs and charts, and comparisons to historical and peer usage, and your specific corporate guidelines. It’s a great tool to reiterate company policies while creating a shared responsibility. Management-level reporting provides supervisors with usage and cost details for individual direct reports and entire teams. This not only allows managers to identify and address subordinates incurring excessive costs, it lets employees know that their activity is being closely monitored. Big Brother is watching!